Ada Byron Lovelace had the misfortune of having a famous father (Lord Byron) who abandoned her and her mother when Ada was only one month old. Despite the immense disadvantages of her childhood and gender, Ada was determined to learn all she could in the fields of math and science. 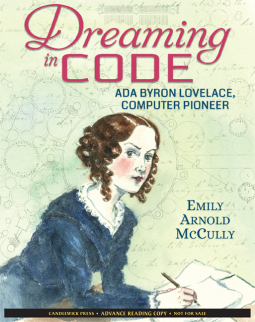 Dreaming in Code is good bridge for middle school readers ready for a longer biography. At 176 pages, it probably won't be read in one sitting. I would caution parents that it does deal with some mature topics. The descriptions of Ada's work may also be a bit challenging for readers to understand. While overall it was interesting to learn about Ms. Lovelace, her life was rather tragic and her gender did pose significant challenges when it came to being fully accepted in the worlds of math and science. Wikipedia offers more details on her life. Emily Arnold McCully has tackled a difficult topic and made it accessible for middle and high school readers. I think students today should be made aware of the female pioneers who paved the way for future generations. Disclaimer: I received a free digital copy of Dreaming in Code from NetGalley for the purpose of review.